No significant changes concerning the TOTH. Well that's the first time we've had some business headlines at the TOTH in GMT, the title sequence is back at the end of the headlines. Not too sure about George turning to a screen where the report is playing from. Nice to have the World news 'stings' back in the countdown. 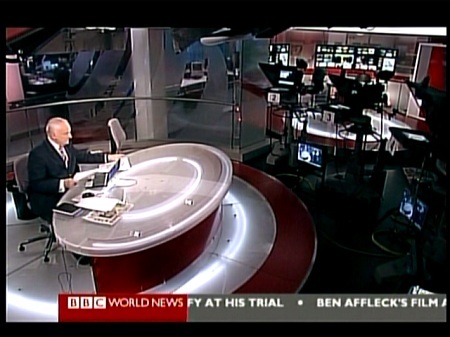 Interesting to see it take a News Channel type end by ending in London. No major change in the GMT titles. Incredible, it feels like I'm watching a totally different channel. The production standards have been lifted to a completely new level. The use of the studio in the first few minutes has been fantastic, I really hope they keep it up. Really liking the sleeker and simplified graphics, too. Don't like the straps ticker or dog... nice countdown music... good footage. Really like the new smaller graphics, set is grand, countdown was too short, everything feels strange. I've only seen one of the pilots, for Newsday, and there was a nice little difference in the TOTH for that. And all the robot cameras slowly moved down, as if they were taking a bow. Nice, the sport logo is yellow in the ticker. 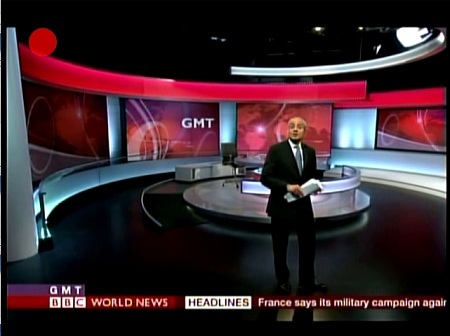 The studio is great but I think the graphics will take a bit of time to get used to , I'm not keen on them. In my opinion the old ones are better. There seems to be a lot of talk of it being the last TOTH from TVC. They'll be back there for the overnights.